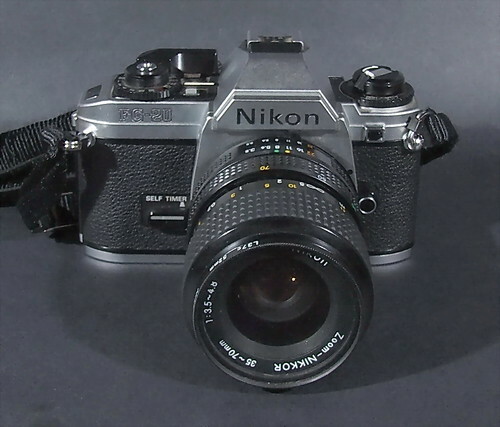 Nikon FG-20 is a 35mm film SLR camera, manufactured by Nippon Kogaku K. K., Tokyo, Japan, (Nikon Corporation since 1988), and produced between 1984-1986. 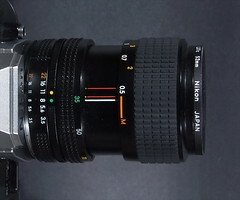 The Nikon FG-20 is the successor to the earlier Nikon EM and Nikon FG cameras. It is actually a downgrade from its most direct predecessor, the FG. 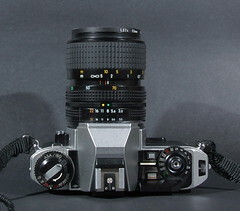 The FG-20 could be considered a variant of the FG, as the only differences between the two is the omission of program auto exposure mode and TTL (through the lens) flash metering. Audible warning: works in Auto mode, when speed dial set on green sound icon, "beep-beep" warning sound activated as soon as shutter release button is depressed halfway when shutter speed is below approx. 1/30 sec. or above 1/1000 sec. Battery check: when pressing half way to shutter release, the meter needle in the viewfinder must be above the index scale's bottom red zone, if the battery is insufficient the needle stays in the bottom red zone. Engravings on the lens barrel: Made In Japan (black), and serial no. This page was last edited on 28 February 2019, at 01:35.